These delicious low-carb crepes are perfect for those avoiding gluten, grains, or carbs! Fill with your choice of fillings, sweet or savory, for a special treat. Mix all ingredients well, making sure all clumps of coconut flour are broken up. Allow to sit for a few minutes and then mix again. In a skillet over medium-low heat melt 1 teaspoon of coconut oil, tilting pan to coat and allow pan to preheat well to prevent sticking. Add about 2 tablespoons of batter and tilt to make a 6-inch circle. 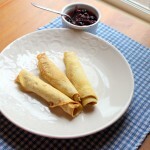 Cook crepe until bubbles start to form and the middle of the pancake looks slightly cooked. Flip gently with a thin spatula and cook until the other side is golden; about 5 minutes on the first side, 2 on the second. Tips: Make sure skillet is pre-heated well. Add fat to prevent sticking between each crepe. Do not use Bob's Red Mill coconut flour- it's not fine enough to bind and the crepes will fall apart.